For many people who don’t go to the cottage during the winter, this season can seem to last forever as they patiently wait for a return to warmer weather and a return to cottage life. While reading the following books won’t reduce the time until you return to your nature retreat, they might increase your respect for your wilderness home and enhance the enjoyment of the time that you spend there. These books will also make the time until you open the cottage more enjoyable – and educational. Whether you are planning the creation of a new cottage, redecorating an old one or you simply like to read about (and look at) rural retreats, Cottage Living: Designing Comfortable Country Retreats is an informative and entertaining book. Written by Ellen M. Plante, this attractive coffee table book contains more than 150 colour photographs. My wife Lynn and I are currently planning our nature retreat. While it is an exciting time, it is also a little overwhelming as we try to efficiently plan the cottage layout and imagine how certain rooms will look when they’re finished. Reading through Plante’s history of cottages and decorating ideas ,and perusing the beautiful photographs, has given us lots of ideas – some we might incorporate into our cottage plans and others we’ll likely use after our wilderness home has been constructed. 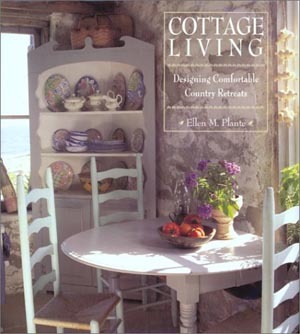 Since Cottage Living combines good decorating ideas with considerable information about cottages, it will be a beneficial reference book in the coming years as we build, decorate and live in our cottage. The best book of nature quotations that I’ve read is A Nature Lover’s Book of Quotations. 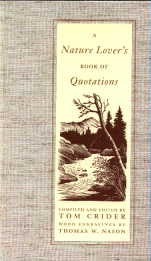 Compiled and edited by Tom Crider, this book has an impressive selection of nature quotations by luminaries such as John Muir, E.B. White, Oscar Wilde, Henry David Thoreau, William Shakespeare, Plato, Barry Lopez, Thomas Jefferson, Mohandas Gandhi, Ralph Waldo Emerson, Rachel Carson and Charles Darwin, to name a few. Numerous illustrations by Thomas W. Nason complement the selections. Quotations on particular topics or by specific people can be quickly looked up in the contents or index. A Nature Lover’s Book of Quotations is an ideal book to leave around the cottage so that it can be read by guests and visitors. It would also make a nice gift for the naturalist in your life. While most of us may not have scientific proof that the climate is changing, many of us have noticed, and may even have commented on, things that should have triggered a warning sign. Mild winters, harsher and more frequent storms and dryer, hotter summers are a few climate changes that I’ve noticed in recent years. Robert Hunter, in his well researched, extensively documented book 2030: Confronting Thermageddon in Our Lifetime, provides us with compelling evidence of what many of us have been dreading – that global warming is occurring, that it is caused by our species and, if not immediately dealt with, will result in devastating consequences for the planet and all of the species that live here. Hunter warns that our dependence on fossil fuels and the other things that cause global warming must be significantly and immediately reduced. And, even if we can pull this off, we still won’t be out of the woods. While Hunter’s vital message is sobering and upsetting, it should be viewed as a wake-up call for all of us. There is hope, provided we start respecting the Earth and act accordingly. We know our present lifestyles are destroying the planet. It’s time we did something about it. 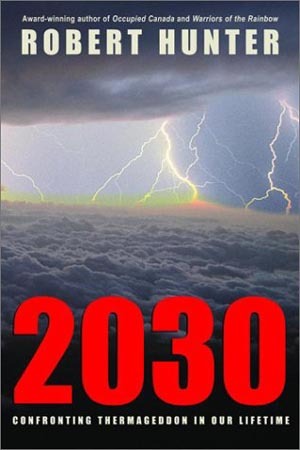 2030: Confronting Thermageddon in Our Lifetime is, for obvious reasons, a “must read”. When it comes to protecting the Earth, ignorance isn’t bliss – but it will be deadly. My favourite way to explore the area around our cottage is by canoe. Quietly gliding over the water is both peaceful and relaxing – and there is no impact on the environment. Canoes allow you to explore areas not accessible by motorboat or foot. Firefly Books Ltd. has just published a coffee table-style book on the history of the canoe. 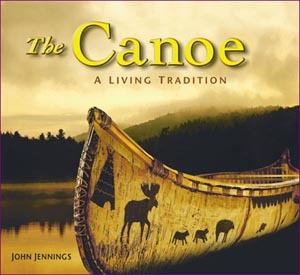 Edited by John Jennings, The Canoe: A Living Tradition is an informative book written by twelve canoe experts. More than 400 photographs complement the text and make this book a truly impressive volume. The Canoe: A Living Tradition looks at bark canoes, kayaks, dugouts and umiaks as well as how they were constructed and used. This book will be at home in any cottage. Exploring the familiar shores of a special wild place is a wonderful experience. And just as your canoe brings with it a feeling of comfort and familiarity, so should your own paddle. While you can find a paddle that you’re comfortable with, if you look hard enough, you can also make your own to your exact specifications. 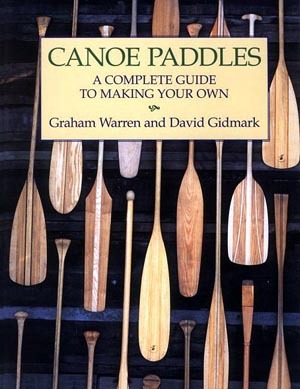 Canoe Paddles: A Complete Guide to Making Your Own by Graham Warren and David Gidmark is a comprehensive guide, with lots of photographs and diagrams, to making your own paddle. Topics covered in the book include paddle design, woods and adhesives, tools, paddlemaking basics, paddle care as well as plans for a wide variety of paddles such as traditional beavertail, ottertail, voyageur, algonquin, sugar island, whitewater paddle, sugar islet-bent shaft and child’s beavertail. After reading this interesting book chances are you’ll want to start planning the construction of your own paddle. Learning to respect and protect the environment involves learning about the natural world. Two educational series that will both interest and inform young and beginning naturalists are the Peterson First Guides and the Peterson Field Guides for Young Naturalists. Published by Houghton Mifflin Company (distributed in Canada by Thomas Allen & Son Limited) these quality guides offer considerable information to beginning naturalists on various plants, animals and other topics. 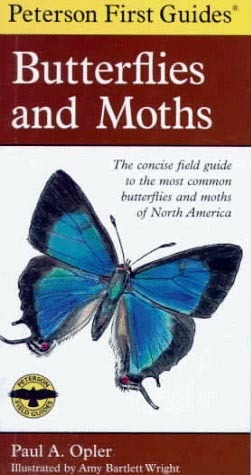 Peterson First Guides combine a small amount of written information with quality illustrations of several kinds of animals or plants (close to 200 kinds of butterflies and moths are in Butterflies and Moths) while the Peterson Field Guides for Young Naturalists contain more text but looks at fewer animals or plants (20 of the most common butterflies in North America are contained in Butterflies.) The small size of the books in the Peterson First Guides (they can fit into your pocket) combined with the numerous animals and plants contained in each book make these books ideal to take into the field. 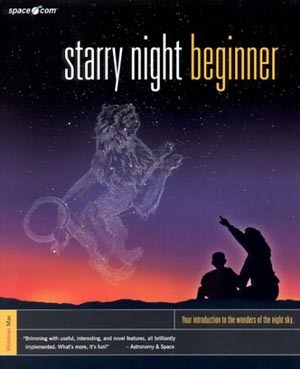 Starry Night Beginner is an informative computer program that allows you to explore the night sky and locate and learn about planets, comets, asteroids, stars and other objects in the sky. After establishing your home location, time and date you can see where stars, constellations, artificial satellites and other objects are. This makes identifying these once you are outside much easier. By using the control panel you can change the location from which you’re viewing the sky to anywhere on Earth. You can also change the time and date (anywhere between 200 BC and 3000 AD for Starry Night Beginner and 4713 BC – 9999 AD for Starry Night Backyard) so you can see how the sky will look from a particular location at a specific time. This will allow you to see (and print off a star chart for observing purposes) what the sky will look like from your cottage on a certain night. These are only a few of the many interesting options you have with Starry Night Beginner. A 72-page User’s Guide is included. Starry Night Backyard (Special Edition) has the same features as Starry Night Beginner with several exciting additions. For example, while you can change your location to anywhere on Earth with Starry Night Beginner, with Starry Night Backyard “you can travel around the Earth, the solar system, and even out to the stars!” Starry Night Backyard enables you to add your own new comets, asteroids, satellites and moons and it also shows planet orbits. This special edition of Starry Night Backyard contains an 80-page User’s Guide as well as the very informative and interesting 240-page book Starry Night Companion: Your Guide to Understanding the Night Sky Using Starry Night by John Mosley.